Not much to report today except it is really hot here. 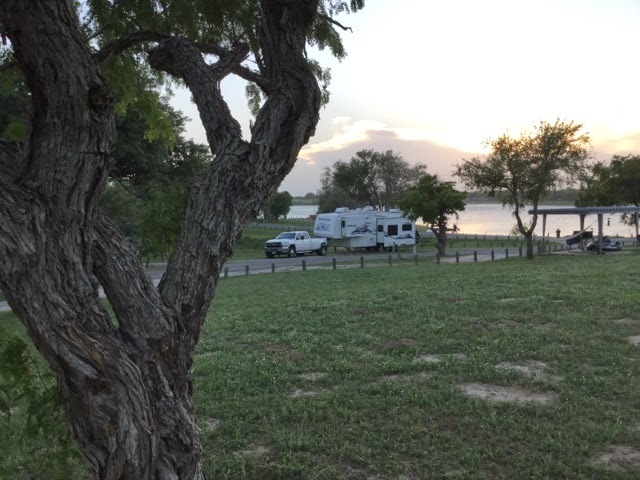 We are outside of Corpus Christi, Texas at Corpus Christi State Park. The temperature is in the 90's, windy, and with very high humidity. Texas has awesome State Parks and they are inexpensive. We paid $16 for our camping spot and we have electrical and water hookups. They have a free RV dump site. There is swimming, boating, fishing, showers, and day use. The park is completely full of people. The lake is huge and they have 108 camping spots. The Lake and the surroundings are beautiful. Hopefully, tomorrow it will be cooler.